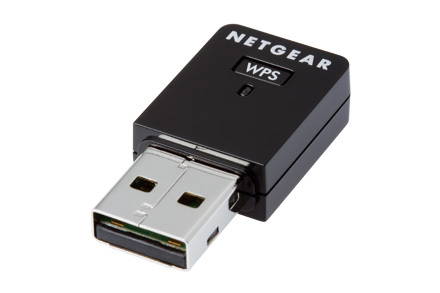 The NETGEAR N300 WiFi USB Mini Adapter wirelessly connects your notebook or desktop computer to a Wireless-N network for applications such as online gaming and a secure and reliable connection to the Internet. The mini design makes this adapter perfect for mobility. NETGEAR genie® is included for easy installation. With the NETGEAR Push 'N' Connect feature, enjoy a secured wireless Internet connection, at the push of a button. Speed makes all your devices really go. And anyplace you need speed, with NETGEAR you got it. The N300 WIFi USB Mini Adapter delivers N300 Mbps speed. Homes come in all shapes and sizes. The NETGEAR N300 WiFi USB Mini Adapter boosts WiFi connectivity throughout your home for all your Internet-enabled devices. NETGEAR genie software on a CD makes it easy to connect to a wireless network. Or, use Push 'N' Connect to add devices to your home network with a push of a button. With the WNA3100M N300 WiFi USB Mini Adapter, connect a laptop to your home network for applications such as online gaming and a secure and reliable connection to the Internet. Download the NETGEAR WNA3100M Datasheet (PDF).